Alternative schools bristle at low scores as second round of assessments is released. 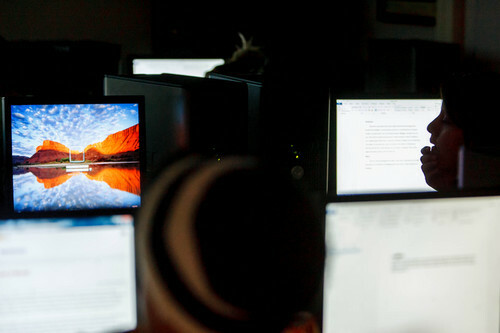 Trent Nelson | The Salt Lake Tribune Students in a computer lab at Mountain High School in Kaysville, Tuesday, September 24, 2013. Trent Nelson | The Salt Lake Tribune Mountain High School students Omar Galeno, Samantha Paskett, Austin Talbert and Sasha Brennan talk about their experiences at the school, in Kaysville, Tuesday, September 24, 2013. 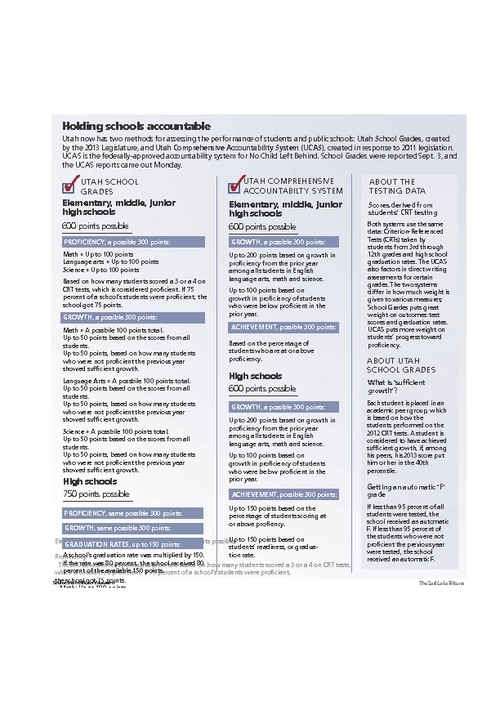 Holding schools accountable Utah now has two methods for assessing the performance of students and public schools: Utah School Grades, created by the 2013 Legislature, and Utah Comprehensive Accountability System (UCAS), created in response to 2011 legislation. UCAS is the federally-approved accountability system for No Child Left Behind. School Grades were reported Sept. 3, and the UCAS reports came out Monday. Trent Nelson | The Salt Lake Tribune Tomee Pace teaches a psychology and marketing class at Mountain High School in Kaysville, Tuesday, September 24, 2013. 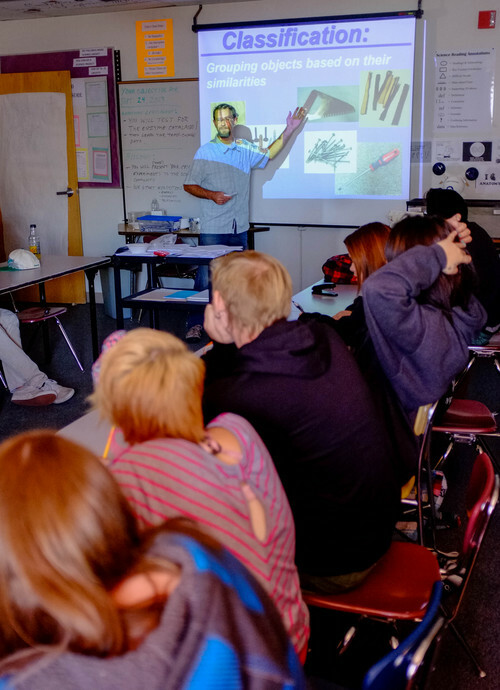 Trent Nelson | The Salt Lake Tribune Cody Banks teaches a science class at Mountain High School in Kaysville, Tuesday, September 24, 2013. Trent Nelson | The Salt Lake Tribune Mountain High School principal Kathleen Chronister in Kaysville, Tuesday, September 24, 2013. Trent Nelson | The Salt Lake Tribune Mountain High School principal Kathleen Chronister shows the school's food bank in Kaysville, Tuesday, September 24, 2013. 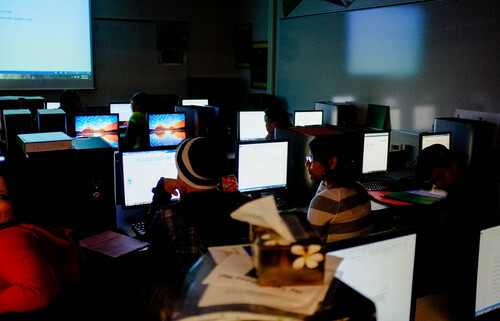 Trent Nelson | The Salt Lake Tribune Students in a computer lab at Mountain High School in Kaysville, Tuesday, September 24, 2013. Trent Nelson | The Salt Lake Tribune A sign in a computer class reads, "Do you work better alone or on a team? Why?" at Mountain High School in Kaysville, Tuesday, September 24, 2013. Trent Nelson | The Salt Lake Tribune Mountain High School students Matrace Halliday and Sasha Brennan talk about their experiences, in Kaysville, Tuesday, September 24, 2013. Trent Nelson | The Salt Lake Tribune A student in a computer lab at Mountain High School in Kaysville, Tuesday, September 24, 2013. 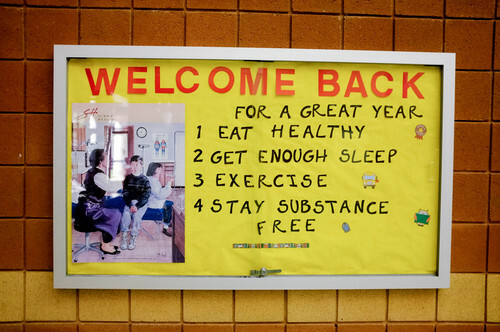 Trent Nelson | The Salt Lake Tribune A sign at Mountain High School offers health advice to students, in Kaysville, Tuesday, September 24, 2013. 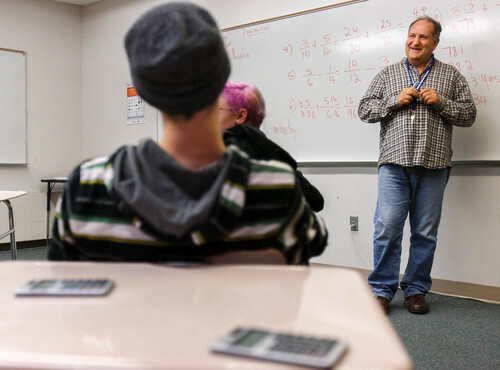 Trent Nelson | The Salt Lake Tribune Federico Urquijo-Ibarrola teaches a math class at Mountain High School in Kaysville, Tuesday, September 24, 2013. Trent Nelson | The Salt Lake Tribune A sign in a computer class reads, "Do you work better alone or on a team? Why?" at Mountain High School in Kaysville, Tuesday, September 24, 2013. Mountain High students were incredulous to learn that their school got an "F" when Utah school grades came out in early September. "That&apos;s so crazy," said one teen in a double-hour English class last week, echoing the sentiments of educators and students up and down the state. But perhaps no one was more pointed in her criticism of the Utah Legislature&apos;s new grading system than Mountain High Principal Kathleen Chronister. "It kind of feels like a kick in the face," says Chronister, whose 244 students struggle with issues that include depression, anxiety, bipolar disorder, attention deficit disorder and addiction. Thirty-five students are parents; 17 percent are homeless. Results were released Monday from Utah&apos;s other school assessment program, the Utah Comprehensive Accountability System (UCAS), which takes into account at least some of the unique challenges in alternative schools. The scores for 18 alternative schools won&apos;t be released until next week. Parents and others can go to 1.usa.gov/1eVsxjm and search for a school&apos;s name, then choose to see its UCAS score or the grade released earlier this month. 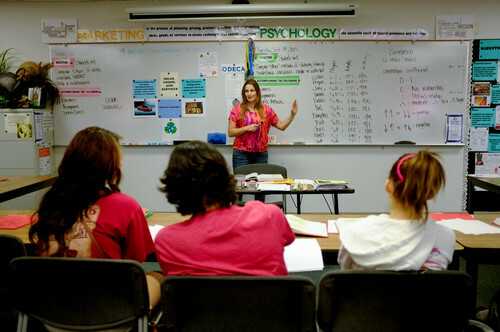 Teens turn to alternative high schools such as Mountain High in Kaysville when they can&apos;t succeed in traditional schools. Alternative schools earned nine of the 16 F grades assigned to high schools, even though traditional high schools outnumber them by 3 to 1. Lawmakers said they wanted grades assigned to schools so parents could see, at a glance, how their schools perform. UCAS was developed by the Utah Office of Education in response to an earlier legislative mandate. It also is the federally approved accountability system under the No Child Left Behind law, replacing Annual Yearly Progress. Both accountability systems depend on the same set of data: scores on Criterion Referenced Tests (CRTs) that Utah students take from third grade on. Both also consider high school graduation rates. They differ in the weight given to improvements, with UCAS giving credit for even incremental gains and school grades crediting only the greatest gains. School grades do not distinguish alternative from traditional schools. UCAS was supposed to assign letter grades to each school this year, but the Utah Board of Education backed away from that when the Legislature adopted school grades. Chronister, in a letter to Sen. President Wayne Niederhauser, R-Sandy, said that the school grading system by its "very nature is designed to sort and select schools to ensure failure by some." "My students then must surely be failures as well," Chronister wrote. "Believe me, they&apos;ve all been told at some point in their lives that they are failures." Samantha Paskett, 17, of Layton, said acute anxiety and depression dogged her when she attended Layton&apos;s 1,850-student Northridge High. She often skipped school. "I hated, hated it," she said. Her symptoms fell dramatically when she moved to Mountain High, where she is surrounded by students with their own troubles and teachers who, she says, "care." Now she&apos;s on track to graduate in the spring and hopes to attend Salt Lake Community College and eventually, Dixie State University. She wants to study music production. Austin Talbert, 17, says the school changed his life after he transferred from Viewmont High in Bountiful. He now has dreams of becoming a nurse anesthetist. "I have hopes for college now," he said. "That never would have been the case before." Chronister said that although three-quarters of her students are two years behind in credits when they arrive, they double down on their work. Each year, Mountain High graduates roughly 100 students, many of whom would have dropped out of school. "Hold us accountable for our mission," said Chronister. Niederhauser acknowledged the blowback from Chronister and other educators and said the school grades legislation may need to be tweaked because the way it was interpreted by the Utah Office of Education resulted in a bell curve requiring some schools to fail. "Grades weren&apos;t intended to give a scarlet letter to anybody," he said. "My involvement has always been about bringing some very simple clarity … so we could identify where we need to make adjustments." The Legislature, he predicted, will discuss whether alternative high schools should be treated differently. "That&apos;s a discussion I&apos;d like to have." Search for your school&apos;s name at psdreports.schools.utah.gov/Gateway and you will have a choice of seeing its score under the 2013 Utah Comprehensive Accountability System (UCAS), released Monday, or the school grades released in early September. UCAS scores, out of a possible 600 points, range from 587 at Nibley Elementary in Logan to 127 at the Jean Massieu School for the Deaf in Salt Lake City. The statewide median for high schools rose from 408 points in 2012 to 417 in 2013. Under new 2013 Utah Comprehensive Accountability System results released Monday, these are the schools with the top 10 highest scores out of a possible 600. No high schools appear in the top 10. These are the top ten highest-scoring Utah high schools, preceded by their placement on the full list. The top 10 schools overall included only elementary and junior high schools.